He’s been called “the most accomplished athlete in professional wrestling history,” and perhaps one of its most controversial. After an incredible debut run in WWE that saw him crowned WWE Champion at WrestleMania, Brock Lesnar tried out for the Minnesota Vikings, performed in Japan, and then moved to the world of MMA. And he was pushed there, too. Capitalizing on both his name and his raw talent and athleticism, Lesnar became UFC Heavyweight Champion. Brock would eventually return to the WWE, and enjoy a run that has been arguably even more dominant than his first. It’s safe to say that Brock has always polarized audiences. 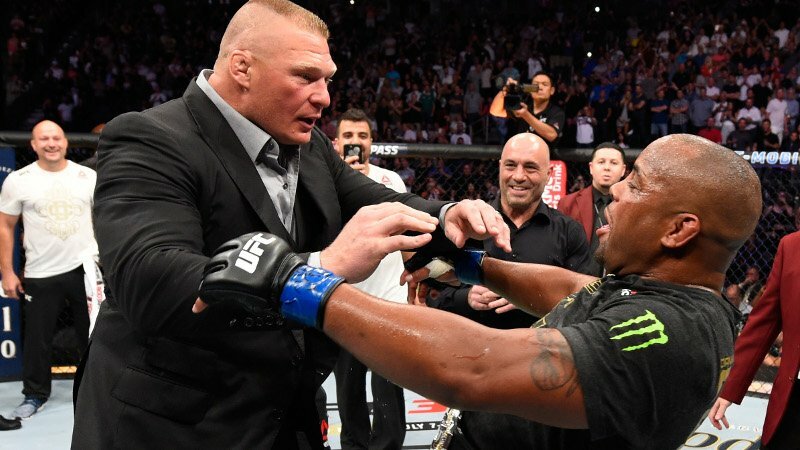 Whether it was his sudden exit from WWE in 2004, his “Streak”-breaking victory over The Undertaker, his UFC return victory over Mark Hunt and subsequent doping violation, or his recent confrontation with Daniel Cormier at UFC 226, Lesnar has made a habit of stirring the pot… and sometimes pouring its entire contents over the floor. Brock is currently the WWE Universal Champion, and he’s closing in on the 500-day mark in his reign. While many believe that Lesnar’s reign and his sporadic defenses are holding back WWE’s talent, especially on Monday Night RAW, others believe that Brock is the last thing that pro wrestling fans can believe in. It’s a tug-of-war, and Lesnar’s UFC connection is at the center of it. He has to lose the title soon… right? You can try to keep it alive, and many have, but kayfabe is essentially dead. That should come as no surprise to today’s pro wrestling fan. But, there still needs to be some suspension of disbelief. As wrestling fans, we need to be engaged in the shows we’re watching and excited to find out what happens next. Part of the fun is not knowing who will win or lose, or when. We should still become elated when our favorite competitor is victorious and frustrated when he or she suffers defeat. Memories of the Monday Night War aside, we shouldn’t always know the results of big matches before they happen. There has to be some element of surprise. Which brings us to Brock Lesnar. When rumors of Brock’s negotiations with the UFC kicked up before WrestleMania 34, it became even clearer to fans that he would be losing his title to Roman Reigns. In one of the most bizarre and shocking main events in WrestleMania history, Lesnar prevailed. Fans then turned to WWE’s Greatest Royal Rumble. If Lesnar is returning to UFC, it would follow that he would lose his title and put over the next champion, and probably at a big event. Yet, Lesnar once again defended the Universal Championship successfully, seemingly getting rid of the problem of fans being able to easily predict the main event. That doesn’t totally resolve the situation, however. Should the anticipation and excitement of a big match be based on whether or not one of the competitors will (non-kayfabe) leave the company, and when? That seems like a very cheap way of creating excitement for a match; one whose interest should instead be based around the talent and athleticism of the performers, their storyline conflicts with each other, and other elements that stay true to the art form itself. While the results of the main events of WrestleMania 34 and Greatest Royal Rumble were shocking, a major source of the surprise was our belief that one of the competitors would be leaving to prepare for a different sport after the event. And something about that feels wrong.